MOSCOW, January 11. /TASS/. Presence of foreign particles inside the engine’s pump or violations of assembly procedures that occurred in the process of engine’s manufacturing may have been to blame for the loss of the Progress MS-04 cargo space vehicle last December, the Russian space corporation Roscosmos said on Wednesday. The panel of inquiry has arrived at the conclusion that the oxidizer tank of the third-stage engine was ripped open with an impact of fragments that emerged with the destruction of engine 11D55 as a result of combustion and further destruction of the oxidizer pump. The oxidizer pump may have caught fire for various reasons, such as the likely presence of foreign particles inside or violation of the engine 11D55’s assembly procedures (wrong clearance between parts or the rotor’s unbalance and runout). Defective workmanship manifested itself in flight," the report runs. Roscosmos said a plan would be presented soon for priority measures to be taken at space rocket industry enterprises to guarantee the safe launch of the cargo vehicle Progress MS-05. Earlier, Roscosmos postponed the launch from February 2 to February 21. 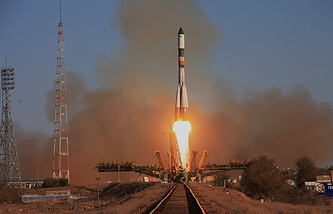 The space corporation did not provide any details as to what rocket would be used to launch the Progress craft - Soyuz-U, which crashed in December, or Soyuz-2. The cargo spacecraft Progress MS-04, which blasted off from the Baikonur space site in Kazakhstan on December 1, was lost in the 382nd second of flight over Tyva at an altitude of 190 kilometers. Most of the debris burned up in the atmosphere. The spacecraft had been carrying 2.5 tonnes of cargoes, including New Year presents, to the International Space Station’s crew. The probe into the causes of the crash began on December 2 to have been completed on January 11. The inquiry was prolonged several times. The CEO of the Roscosmos corporation, Igor Komarov, led the probe himself.